Fifteen years ago the mobile phone market was still new and exciting. New technologies and features were being squeezed into handsets, and those handsets themselves came in a variety of different designs. And the Nokia 7600 was certainly different. In fact, the 7600 is probably one of the weirdest looking phones ever made. Let’s ignore the shape for the moment – the 7600 squeezed in some very advanced features for its time. It had a 2” colour display, a VGA resolution camera that could also take really basic low-res videos, Bluetooth, an MP3 player, Java, a stonking 29MB of internal storage, email support, a WAP browser and most importantly of all the Nokia 7600 was a very early 3G phone capable of an awesome download speed of 384 kbps. Nokia 7600. There's a reason phones don't look like this. It’s easy to be dismissive of these specifications, but the 7600 really was something very advanced for its time. On paper it should have been a success – but for some unfathomable reason they packaged it in about the maddest way possible. Instead of putting the keypad at the bottom, Nokia decided to put the numbers on either side of the screen with the call control buttons and selector pad at the bottom. This meant that you’d have to re-learn texting completely to use it and you would also have to hold in in two hands. Worse, the buttons were different sizes with the “6” key being particularly tiny. Oh yes, the Nokia 7600 looked immensely cool. The unique shape (curved lozenge? asymmetric rounded rectangle?) looked amazing with swooping intersecting lines and a variety of plastics that contrasted not only in colour but also in texture. It’s just that somewhere along the way Nokia forgot about usability completely and came up with some ill-thought-out but very high-tech fashion accessory. You might guess that the 7600 didn’t sell all that well. Although it had killer specs, the weird design didn’t help its appeal… but also consumers were proving pretty cool when it can to the idea of 3G phones. There wasn’t a lot you could actually do with so-called high-speed data on a tiny 128 x 160 pixel screen. 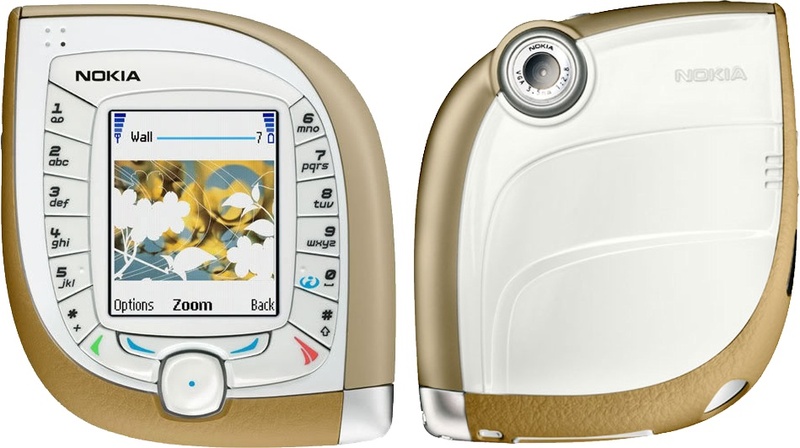 Nokia's "7000" series always had a tendency to be a bit "out there" when it came to styling, but this is one of those designs to file under “W for Weird”. As with a lot of odd-looking Nokias it is somewhat collectible with prices for really good ones being £200 or more, however prices vary a lot depending on condition and accessories.